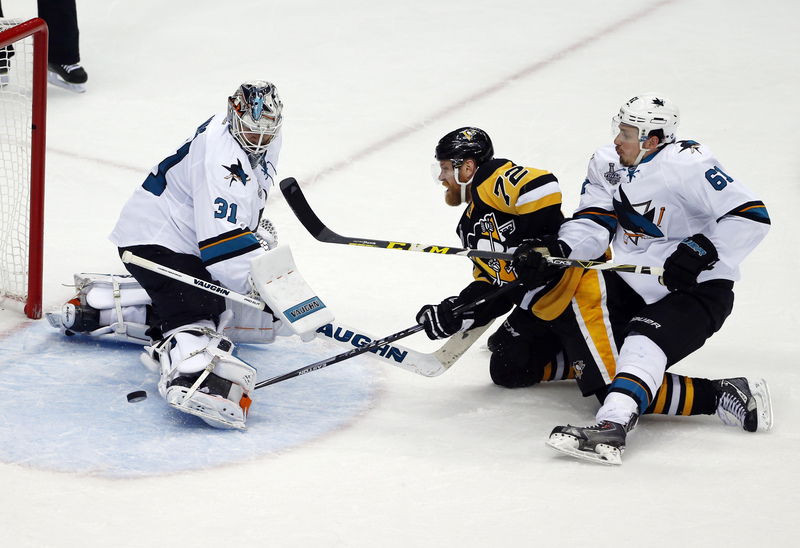 PITTSBURGH (AP) — There’s very little flash to Martin Jones. The San Jose Sharks goaltender speaks in a polite monotone, only too eager to deflect attention elsewhere. Call it a reflex action honed from years spent wearing a mask while intentionally standing in the way of a puck often fired at high speed. Only this time he couldn’t get out of the spotlight. Not after spoiling Pittsburgh’s long-awaited house party with 60 minutes of the best hockey of his life. The Sharks and the understated guy in net are heading back west for Game 6. So are the Penguins. The Stanley Cup, too. Blame Jones, who turned aside 44 shots in a 4-2 victory in Game 5 on Thursday night. Outplayed but not outscored, San Jose heads home with a chance to even the best-of-seven series at 3-3 on Sunday. “Joner bailed us out tonight,” said San Jose defenseman Justin Braun. Repeatedly. Their breakthrough season on the line after spending the better part of four games chasing — but not quite catching — the relentless Penguins, the Sharks responded by jumping on Pittsburgh rookie goaltender Matt Murray early then relying on Jones late. Not that he wanted to talk about it, not even after becoming the first goaltender in the expansion era to win two games in the final while making at least 40 saves. His teammates knew better. San Jose still has a chance to become the second team in NHL history to claw out of a 3-1 deficit in the final because Jones refused to serve as doorman for a coronation for Sidney Crosby and company. The Sharks, particularly their stars, gave him enough in the first period and Jones had all the wiggle room he would need. Logan Couture had a goal and two assists while Brent Burns, Melker Karlsson and captain Joe Pavelski also scored for San Jose, which was outshot 46-22 but held firm after surviving a chaotic opening five minutes and playing capably after getting the lead in regulation for the first time in the series. Evgeni Malkin and Carl Hagelin scored for Pittsburgh but the 22-year-old Murray, whose postseason play helped fuel Pittsburgh’s return to the final after a seven-year break, faltered early and his high-profile teammates struggled to the puck by Jones. San Jose coach Peter DeBoer preached patience with his team in a hole only one club in NHL history has climbed out of to raise the Cup. He pointed to the Sharks’ own first-round collapse two years ago against Los Angeles — when a three-game lead became a 4-3 loss that took an entire season to get over — as proof of how quickly the tenor of a series can change. The Penguins stressed the final step in the long slog from the tumult of December — when Mike Johnston was fired and replaced with Mike Sullivan with the team languishing on the fringe of the playoff picture — would be the most difficult. Yet the prospect of celebrating the first title captured within the city limits in 56 years sent thousands into the streets around Consol Energy Center and ticket were going for well over $1,000. Things were no different inside, with the largest crowd in the arena’s brief history — a group that included Pirates Hall of Famer Bill Mazeroski, whose epic ninth-inning blast in Game 7 of the 1960 World Series at Forbes Field a couple miles up the street marked the last time a championship season ended in Pittsburgh — in a frenzy from the opening faceoff. It took all of 64 seconds for the Sharks to quiet them and 2:53 to leave them stunned. Burns’ first goal of the final, a wrist shot from the circle that didn’t look unlike Joonas Donskoi’s overtime winner in Game 3, put San Jose in front in regulation for the first time in the series. Couture doubled San Jose’s advantage less than two minutes later with a redirect in front of the net. The momentum evaporated quickly. Malkin scored on the power play 4:44 into the first and Hagelin followed 22 seconds later to tie it, the fastest opening four-goal sequence in the history of the final. Things settled down — at least a little — until Karlsson’s shot from in front with just under five minutes left in the first, set up by a pretty backhand feed from Couture. The advantage set the stage for Jones, who spent a large portion of the second period fending off one odd-man rush after another as Pittsburgh’s frenetic speed pinned the Sharks in their end for long stretches. Yet the goalie who watched as a backup behind Los Angeles star Jonathan Quick two years ago as the Kings roared back to stun San Jose on their way to a title gave the Sharks the spark they needed to extend their season for at least three more days and keeping their slim hopes of raising the Cup themselves alive.